Actor and artist, Clifford Reynolds Jr. grew up in Highland Park and attended what was then called Wayne University in Detroit. He married in 1945, moved with his wife to California in 1952, and they divorced in 1968. 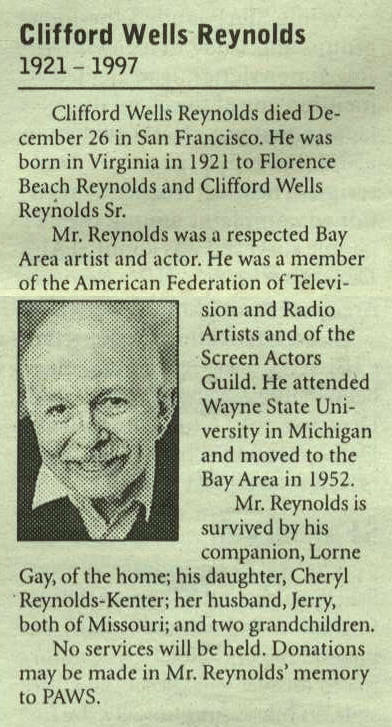 A radio and television performer, Reynolds was survived by companion Lorne Gay. Author michiganlgbtqrememberPosted on June 24, 2018 June 24, 2018 Tags 1921 births, 1997 deaths, artists, Detroit, entertainers, expats, Highland Park, WSULeave a comment on Clifford Reynolds Jr.
As a fighter pilot in World War II, Pontiac native and Rochester Hills resident Robert Harper survived weeks in the jungles of the Philippines after his plane was shot down. With degrees from Albion and Michigan State University, he taught in the Waterford Schools for twenty-five years. Harper was of a generation that never told their parents they were gay. Irma Wolf grew up in Mount Clemens and worked as a stenographer and sales clerk during World War II. After the war, she moved to Los Angeles where, in the 1950s, she served as editor of ONE magazine under the name Ann Carll Reid. C. Bruce Lee served with the Tuskegee Airmen in World War II, after which he earned an M.S. and Ph.D. from the University of Michigan and later held a high-level position with the federal government. He appeared in the documentary film Coming Out Under Fire. David Whitney Brewer was founding vice chairman in 1958 of the Detroit Area Council of the Mattachine Society, the first known homosexual organization in the State of Michigan.